Every new bit of flooring Disney has put in hasn't matched what's around it- from the new brick inlay trolley tracks (doesn't match the brick on the sidewalk or hub) to the new rocks around the lagoon, to the floor outside the Mansion, and now this. Is it that hard to make sure some pavers are the same color as what's around it? Yeah I remembered when I played RCT on PC. I thought "park beautification" was a waste of time too. Happy to see that Disney management agrees with 5 year old me. EDIT: Wait.... not only are those bricks a different color, the ramp part of the curb is too. Yeesh. I was being sarcastic... this time. 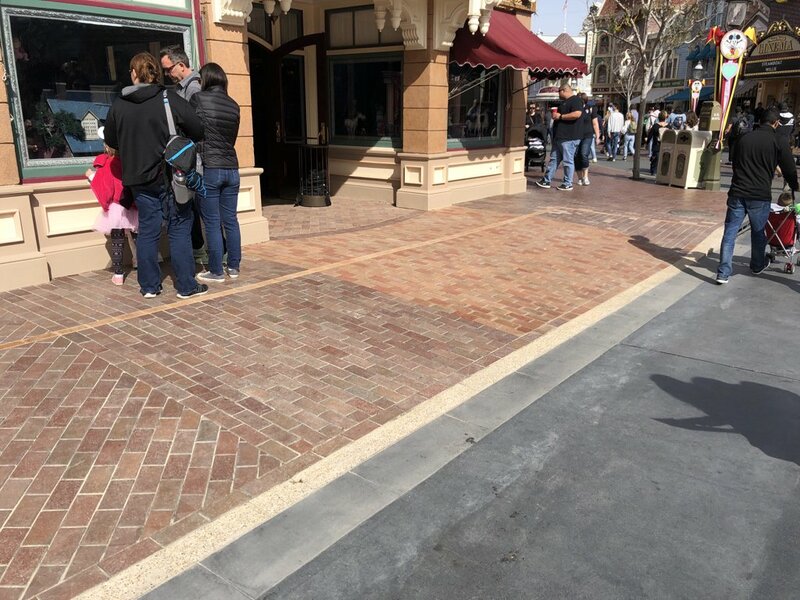 But I have noticed that they aren’t really putting much attention into all the mismatced pavement around the resort after these quick planter removals. Everything right now seems to be operations first and aesthetics second and while I understand that it’s tough line to walk I believe there is room for improvement. Examples: new Tiki room Queue, Big blue Dumbo wall and all mismatching pavement where planter removals have taken place. Part of that will be helped with Father Time and weathering but as we know the attention to detail is lacking with modern Disney/ WDI. I know it's meant for ecvs but we all know it's really for strollers. The problem is they chose to start this project less than 6 months before the opening of Star Wars: Galaxy's Edge, so now they're rushing to get everything done when it's stuff they should have had done a year ago. While the color/shape mismatch is noticeable now, it'll fade and charm will set in. If anything it'll make it look more like a true Turn of the Century Main St as most didn't have uniformity in their brick work. My hope is they do this with the rest of the curbs along Main St.
How does charm set in? As time passes it’ll look like it’s always been there and become charming just like the rest of Main St. It happened at the Haunted Mansion on opening day. Charm is not given. Charm is earned. A year ago, they were working on the trolley track and bricks. This time of year is when they have their usual park rehab. There’s no difference if they choose to do it now when GE isn’t done yet. Is it such a bother for the average guest? Not more than usual. They would be working on something else to complain about. Or complain about lack of upkeep. Or complain they haven’t done what needs to be done because budgets. Well, keep complaining. Don't forget the fall back of peeling paint. That was all Micechat was good for. 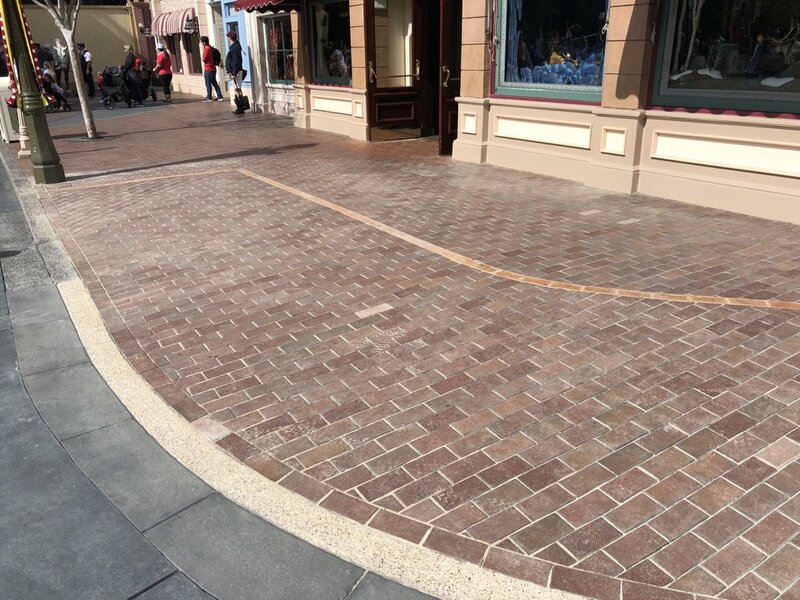 I've always assumed that someday Disneyland and Magic Kingdom would completely remove the curbs on Main Street, but seeing these photos, I'm hoping that they don't. I'm all for making the parks more accessible, but there has to be a better way to do so. The flat curb looks very strange to me, and I think it would look really bad if the entire street switched to flat curbs. Maybe they should make the storefront entrances have flat curbs but leave the rest as-is. That and burned out light bulbs. I hated that I read those updates because I started looking for what was wrong instead of enjoying all that was great. Don't do that anymore thankfully. I wish they would bring attention to all the burned out lights in the pulsating blue tunnel between the lift hills. You can’t miss those or forgive Disney for not replacing those after this many years.